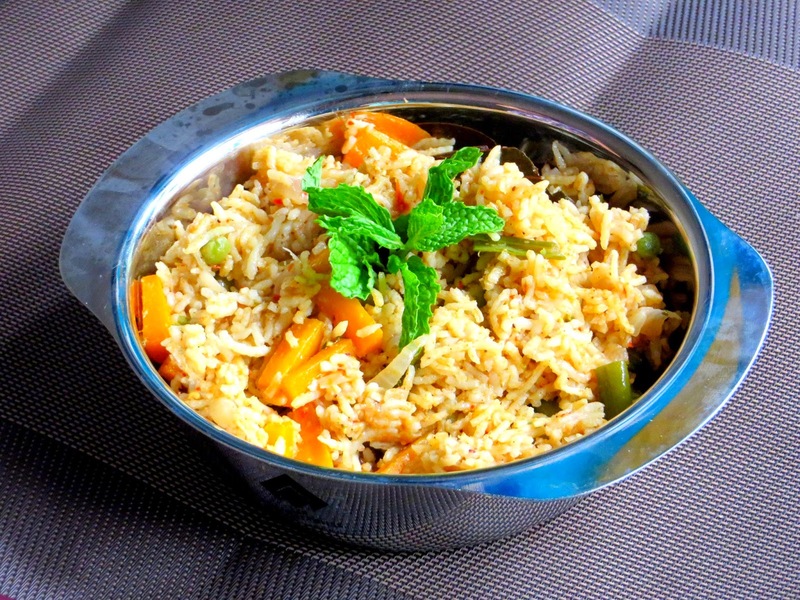 To my knowledge, brinj is a traditional vegetable biryani, where coconut along with spices are ground and the rice and vegetables are cooked along with this coconut spice masala. A tasty and filling one pot meal that's just right for a quick sunday brunch. This biryani is usually served with raitha, preferably onion raitha. Its definitely a must try recipe. Here's my version of the recipe using pressure cooker. Make it a totally vegan dish by avoiding ghee. Grind all of the above ingredients under the head Grind: using half cup water. In a wide pressure pan or pressure cooker, heat oil. Add bay leaf and then onions. Fry onions until its cooked. Now add the ground masala. Add 2 teaspoons salt and stir well. Keep frying until good aroma comes and oil separates. By this time the tomatoes will be well mashed and fully cooked. Wait for most of the moisture to be absorbed or you will end up with a soggy biryani. Now add the vegetables (carrot, beans, pea) and roughly chopped mint. Sprinkle 1 teaspoon salt and stir well. Wash 2 cups basmathi rice and drain water. Add it to the vegetable mixture. Stir for a minute and add 4 cups water. Mix the content and close it with the lid. Cook in high heat for exactly 2 whistles and turn off. Open the lid only when the pressure is completely released. Take out the bay leaf and gently stir without breaking the rice. Its optional to add ghee fried cashews and squared ghee roasted white bread pieces. The recipe looks lengthy but its actually easy. Adding big chunks of potatoes along with other vegetables is optional. I usually don't add potatoes to biryani's and pulaos.